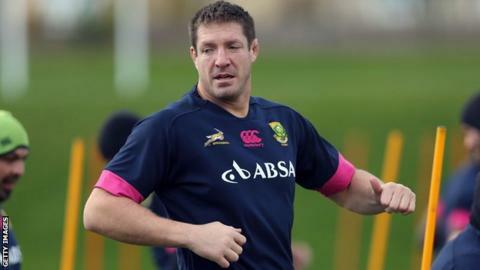 South Africa lock Bakkies Botha is expecting a tough return to international rugby against a "phenomenal" Scotland team on Sunday. Botha will win his 77th cap at Murrayfield after more than two years out of the Springbok team. "The Scottish team ended third in the Six Nations last year and they are a phenomenal side," said the lock. "They showed against the Japanese side that they are a team that plays for 85 minutes." Both sides are looking to build on opening wins in their November series, with Scotland beating Japan 42-17 last week as Heyneke Meyer's team beat Wales 24-15. Toulon forward Botha, who lists Braveheart as one of his favourite films on his South Africa Rugby profile, is familiar with several Scots playing their rugby in France. "Now recently a lot of Scottish players are playing in the French league as well, especially in the lock position, like Richie Gray, so that makes them a good side as well," he said. Botha, who was part of a losing South Africa side at Murrayfield in 2010, recalled: "The Scottish are very physical at the breakdowns and definitely, when their tails are up, it's a difficult side to keep with on the day. "We are focusing on what we can improve as a team, taking all the positives out of Wales and working hard on the negatives. "It doesn't matter which Test match it is, it's always a tough one and it's not going to be any easier this weekend playing against the Scottish team." Botha's international career looked to be over, but the 34-year-old always retained hope of adding further chapters to his illustrious Springboks career. "I'm more happy about it than surprised," said the World Cup winner. "The day when I left for France two years ago, I always said to myself every morning when I get up and go to the gym in Toulon, I still want to play in the green and gold. "The opportunity came around and I was very happy when Heyneke phoned me. "I am just taking it week to week and I'm very happy to be part of this amazing squad after two years." Meyer's side beat Scotland during the latter's summer tour and the Springboks head coach also expects a difficult match in Edinburgh. Scotsman Richie Gray, not to be confused with the current Scotland player of the same name, is part of South Africa's coaching staff and Meyer has valued his contribution. "Scotland, their breakdown is probably up there with the best," added Meyer. "They're really, really clinical at the breakdown. They play in a lot of these conditions where sometimes it's wet. Their body position's always great and they can keep the ball for a lot of phases. "I've known Richie from way, way back and I've talked to him a lot about breakdown. He's been awesome with the team, especially at the breakdown. We're very fortunate to have him involved. "We're getting much quicker ball now. We're not there yet, but there's a huge, huge difference in our breakdown."